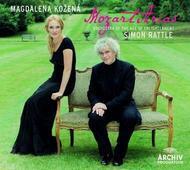 Magdalena Kozená's first all-Mozart album - and her first album in collaboration with partner Sir Simon Rattle - stands out as one of the highlights of the Mozart Forever 2006 celebration. Magdalena is a natural Mozart singer, garnering rave reviews and enchanting audiences wherever she performs Mozart on stage. Recent opera performances in Salzburg, Edinburgh, and at the Met have brought her glowing praise. The album is a collection of some of Mozart's finest arias for female voice, mostly for mezzo-soprano but - typical of her ambition and grace - Magdalena also taps her soprano potential with arias including Vitellia's 'Non più di fiori' from La clemenza di Tito. Sir Simon Rattle is the ideal conductor for this project, delicately wrapping Magdalena's voice in the most vivid and sensitive orchestral sound imaginable. Sir Simon conducts the Orchestra of the Age of Enlightenment, the period ensemble with which he has been working for more than a decade. This release features one of the world's most exciting voices joined by a brilliant conductor and ensemble - a Mozart recording poised to captivate music lovers and critics worldwide.